* Calgary beat Edmonton in a playoff series. C.N.R. won the pennant in both halves of a split schedule. Winners took the pennant in the first half, Elks in the second half. Elks defeated Saskatoon C.N.R. for the provincial title. McKenzie-Stewart's won the league title beating St. Joseph's in the playoff final. It was one of the shortest-ever prairie baseball seasons. The new league, the Western International League, lasted just a few weeks, folding in mid-June. A playoff, between Calgary and Edmonton, was held after the circuit had disbanded. Calgary won the best-of-seven playoff in five games. Calgary's Arthur Schinkel hit .354 to take the batting title. Al Miller, with a 7-2 record, was the top hurler. Four of the players from the abbreviated campaign went on to play in the major leagues - Jimmy Marquis of Vancouver, John Kerr of Calgary, and Charlie Barnabe and Eddie Kenna of Edmonton. There were eight players who had earlier experience in the big leagues, four from Calgary - Carl Manda, Carl Zamloch and manager Bill Rodgers. Two, Pat Kilhullen and Roy Grover, were veterans of the Western Canada League. The others were Bert Whaling of Edmonton and Mose Solomon of Vancouver. 1922 marked the beginning of the Saskatoon Exhibition Tournament, an event of major impact in Saskatchewan. The highly anticipated tourney ran until 1969. One of the outstanding efforts this first season was a 24-strikeout performance by prairie legend Dodger Lewis, pitching for Rosetown. Conquest won the championship downing Rosetown 14-13 in the final. With the demise of the professional W.C.B.L. 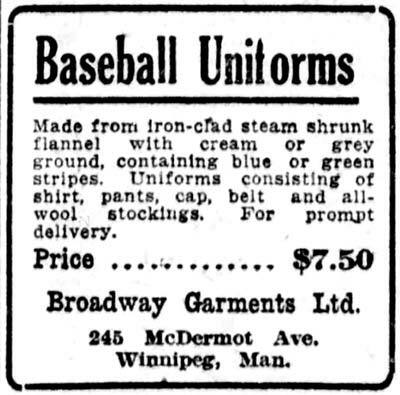 following the 1921 season, the amateur baseball leagues in Saskatchewan's three most populous communities regained prominence during the summer of 1922. Saskatoon, Regina and Moose Jaw each had a city league from which a playoff champion was declared. In the Capital city, the Regina Elks defeated the Regina Winners in three straight games to claim the Northside League title. From the Hub City, the Saskatoon C.N.R. emerged as the champion. Somewhat late in the completion of their city league playoffs, the winning McKenzie-Stewart's of Moose Jaw were denied a shot at the provincial crown when Regina and Saskatoon went ahead with a north-south playoff series without including the Mill City representative. Moose Jaw team officials did not get wind of the Regina-Saskatoon playoff until after its completion and were predictably miffed at the snub. A challenge was then issued to the winning Regina Elks but it essentially fell on deaf ears as they received no backing from the provincial baseball association. With that turn of events, the Regina Elks maintained the Leader-Post trophy as Saskatchewan's senior baseball kingpins for 1922. In Alberta, The Edmonton Red Sox captured the provincial amateur baseball title by defeating Taber 9-1 August 30th to take the best-of-five series in three straight games. The clubs played a 4th game in the evening with the Sox again taking a victory, 8-6. Geddes scattered eight hits to capture the win in the opener as he compiled 11 strikeouts and issued just two bases on balls. Second baseman Spiessman led an 11-hit Edmonton attack with three safeties. Sibbett, the third sacker, had two hits, one a double, and scored a pair. Tuftland took the loss for Taber. In the second game, Edmonton needed two runs in the bottom of the final frame to notch the 8-6 win. Taber had taken a 3-0 lead in the first inning, then fell behind before rallying in the top of the seventh to tie 6-6. Spiessman with a triple and two singles led the Red Sox. Godfrey, with a seven-hitter, picked up the win over Stiffy Lewis. In an exhibition game the following day, Edmonton again won, 9-1. Edmonton had taken the first two games of the final set in Taber, 8-6 anf 9-5 the previous week. Again Spiessman was the big bat for the winners with two hits in the first game and three in the second. Advertisement in the Vancouver Daily World, May 13, 1922. And, of course, a little mystery. Is the Lefty Faulkner who pitched for Weyburn in the summer of 1922 the same Lefty Faulkner who progressed to the major leagues with the New York Giants? You saw Elwood House, a cauliflower-eared catcher, smack a home run for Radville; you saw the gnarled hands of Sharkey Willard playing behind the plate for Weyburn and Pat McNeeley putting on the shinguards for Wapella. You saw Lefty Faulkner, on his way up to New York Giants, pitch for Weyburn and Leo Seiffert, down from Chicago, blast them in for Shaunavon. And the great Nig Donaldson shunting back and forth between Estevan and Moose Jaw and way points that had a few bucks for a good pitcher. You saw Heinie Rogers, jut-jawed and bowed in the legs, step up to the plate for Regina. We have located a couple of reports on Lefty Faulkner in Weyburn. This one from the Leader Post of July 18, 1922 on Weyburn's win over a club from Montana. Weyburn's baseball team defeated Dooley, Montana, here this evening in a good game, taking the long end of a 6 to 1 score. "Lefty" Faulkner for the locals, whiffed 15 of the Dooley players, and allowed but four hits. Larson for the visitors fanned eight of the locals. Batteries for Weyburn: "Lefty" Faulkner and Willard; for Dooney: Larson and Markuson. And, on August 8th, the Morning Leader reported a 4-2 win for Assiniboia over Weyburn. Faulkner compiled 17 strikeouts in pitching for Weyburn. The losers scored both of their runs in the first inning. Assiniboia was blanked until the 8th when four hits and an error produced four runs. There was tragedy during a game in Brandon. BRANDON, June 16 -- Alex Falconer, a member of the Brandon Greys amateur baseball team, dropped dead during the progress of a game here last night with the Leeds N.D. club. A member of the visiting team drove a fly to the right field which Falconer attempted to capture. The ball touched his glove and was seen to drop to the ground as he reached for it. He called out to the first base- man to “get it” and fell on his face. It is thought that death might have been due to the accident which occurred while returning from Minot N.D. on Monday when a car carrying Falconer and six other members of the Greys, while travelling at a rapid rate, turned turtle.